Bake 1 hour and let rest 15 minutes before slicing. Lipton’s onion soup mix was a staple in my mom’s pantry, Kathy, so this recipe makes me super nostalgic. The crunchy ketchup bits on the top were my favourite part. Now the meatloaf/meatball mix of different ground meats, on the other hand, I’ve never heard of. Keep in mind I’m originally from western Canada — I wonder if it might be a regional specialty to Massachusetts (or even to the US)? My father, who is in my book the undisputed champion of spaghetti sauce (oh, and omelets), uses the meatloaf/meatball mix for his meatballs. I found they have a slightly more round taste (buttery?) than straight ground beef. This always contrasts well with the more acidic/salty taste of tomato in meatloaf and spaghetti sauce alike. Further, my mother used to stuff meatloaf with mozzarella or a mild cheddar.. a recipe for a heartattack, but it’s a sweet road there! I grew up with a box of Lipton onion soup mix always in the cupboard. The onion soup and sour cream dip was served at any and all occasions! I now make it with fat-free Greek yogurt and itâ€™s still delicious! It’s snowing in Calgary this week – -17 degrees celcius and this weather calls for an oven dinner. The meatloaf, some baked potatoes and even a couple of sweet potatoes while the oven is on anyway. Roasting some vegetables on a cookie sheet with olive oil. Peppers & onions and dinner is served. Oven supper bakes as I get time to research some old Eaton’s catalogues from 1930 for an article on Alberta Pioneers. Looking at the utensils used back then and I can recognize the potato mashers they sold and the glass dishes and china dinnerware. Stay warm. I just tried your meatloaf recipe, and its safe to say, it was DELICIOUS. I, too, could not find the meatloaf mix and so I made my own. It worked perfect. Thank you so much for taking time to post this wonderful video, I enjoy all of your recipes and videos so much. Thanks Megan! That’s great to hear! Kathy, I am looking for a meatloaf recipes without any eggs as part of ingredients. One of my boys is allergic to it. Can you help? Thanks. I have never tested this recipe using anything but eggs. The eggs keep it moist and helps to bind the ingredients together. Have you tried Googling egg substitutes as there are many Egg Substitute options. Perhaps your family doctor can recommend a dietitian that could help you. 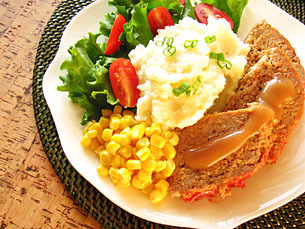 The meatloaf is a staple of American cuisine. Learn how to make a delicious homemade meatloaf with the help of this step-by-step video. You’ll be cooking a fantastic meatloaf in no time!